Merging real stories with theory, research, and practice, a prominent scholar offers a new approach to teaching and learning for every stakeholder in urban education.Drawing on his own experience of feeling undervalued and invisible in classrooms as a young man of color and merging his experiences with more than a decade of teaching and researching in urban America, award-winning educator Christopher Emdin offers a new lens on an approach to teaching and learning in urban schools. He begins by taking to task the perception of urban youth of color as unteachable, and he challenges educators to embrace and respect each student’s culture and to reimagine the classroom as a site where roles are reversed and students become the experts in their own learning.Putting forth his theory of Reality Pedagogy, Emdin provides practical tools to unleash the brilliance and eagerness of youth and educators alike—both of whom have been typecast and stymied by outdated modes of thinking about urban education. With this fresh and engaging new pedagogical vision, Emdin demonstrates the importance of creating a family structure and building communities within the classroom, using culturally relevant strategies like hip-hop music and call-and-response, and connecting the experiences of urban youth to indigenous populations globally. 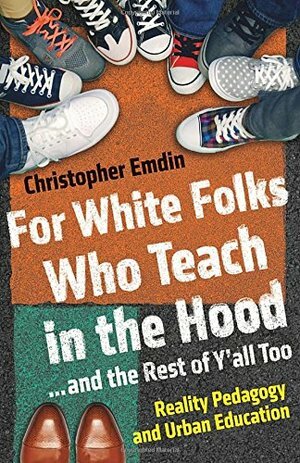 Merging real stories with theory, research, and practice, Emdin demonstrates how by implementing the “Seven C’s” of reality pedagogy in their own classrooms, urban youth of color benefit from truly transformative education.Lively, accessible, and revelatory, For White Folks Who Teach in the Hood...and the Rest of Y’all Too is the much-needed antidote to traditional top-down pedagogy and promises to radically reframe the landscape of urban education for the better.